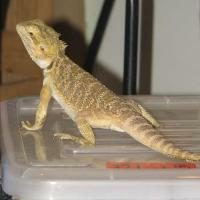 We have 2 clutches of central (inland) bearded dragons in the incubator now due to hatch around Christmas time and mid January 2009. The parents are lemon (female) and gold (male) in colour. 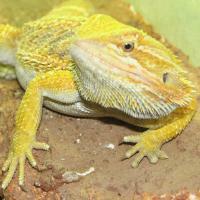 The male in particular has a lovley varied orange and gold colour with a black beard. Click the thumbnails to see the large images. 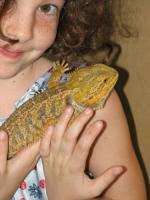 We are situated just north of Brisbane, near Caboolture. We are taking pre-orders now for up to 75% of each clutch at a 20% deposit*, 20% discount on the normal price. Once they are hatched the prices will be $80 each. Order now, pay $16* and get them for $64 in total. Next clutch ready mid to late February, with next lot hatching late February.